More sandcastles along Southbank. Everyone is making the most of the sun, it's been a long time coming. A big helping hand. Looks great. 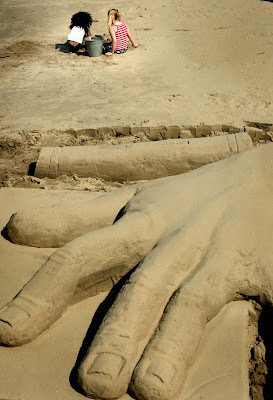 Very artistic work from the sand sculptor and the photographer both. Holy Moly! I need to go get my shovel and start building! it's a great angle and subject, Mo. the giant hand and those two small figures contrast nicely. I love sandcastle art- and I've never been anywhere to see it up close, only in pictures and this is a really good one- wow! This is a great photo, Mo! !